If you’re an American moving to London then you’ve chosen the best time of year to make your pond hop. There is nothing quite like an English summer, and while you will find that it is packed with tourists from all over the world, it is also the time of year when you will be enthralled and entranced by the pomp and ceremony of all that is British. When you’re living in London during the summer, the city comes to life and as a new Londoner; you’ll be able to do all the tourist activities when you arrive in the city and before you settle into your new London rental. One of the highlights of the spring and summer events that take place each year, the Royal Horticultural Society Chelsea Flower Show, also known as the Great Spring Show is one of the biggest gardening and design expo shows in England. Held on the grounds of the Royal Hospital in Kensington, the show is held from the 24th to the 28th of May 2011. It is open from 8 am to 8 pm every day of the show. The Chelsea Flower Show is the most famous show in the country and has been named the most popular and famous gardening event in the world. The Chelsea Flower Show is considered by some as the start of the London social season, so if you’ve just started living in London, and want to get onto the social swirl then the Chelsea Flower Show is the place to start. The capacity of the show is governed by the limited space, and for this year you’ll probably only be able to purchase cancellation tickets to the week long event. The show does not just highlight flower and plants. 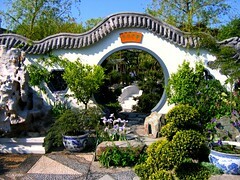 It is a riot of the latest garden design and landscaping talent from the world over. If you are interested in gardening and garden design as well as nature in all its forms then you should have a look at some of the gardening shows held in and around London. The Hampton Court Palace Flower Show is renowned for the Festival of Roses and this year in particular there is a new exhibit called The RHS Edible Garden, which will tell you everything you want to know about growing your veggies and fruit. The Hampton Court Show is the largest in the world, and is on from 5 – 10 July 2011. It’s a perfect day out in the middle of summer while you’re getting settled in.